We are Jeff & Cheryl. We are the "B" team. Our last name starts with B. We have been married for 39 years. We drove OTR/Team and dedicated in the mid 1980's. We were O/O, leased to North American Van Lines. We raised our two boys and are now ready to return to OTR/team driving. Because of the time away (30+ years), we are basically starting over as rookies. In training at Werner Enterprises as team drivers. Well, it’s time for a real update. Sorry that it’s been a while, we have been extremely busy since the last update. We reported to Werner Enterprises’ Atlanta terminal on Monday, December 11th for orientation. It was a jam packed couple of days! Day one was a bunch of employment paperwork, drug screens, physicals, and computer based training. Day two was more of the same with lots to learn in a short period of time. You sure get a lot crammed into your head in the two day orientation! While in Atlanta, we stayed at a hotel called My Place; it’s about a mile and a half from the Atlanta terminal. 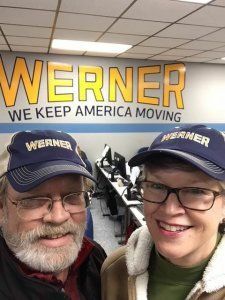 It is owned by Werner, and it’s where they put up all of their trainees, and drivers when their trucks are in Atlanta for repairs or drivers need retraining. The rooms are set up for two trainees per room, but since Mrs. B and I are married, we had our own room. After orientation the trainees continue to stay there waiting for drug screens to come back, more advanced classes, and waiting to be assigned a trainer. All new employees are assigned a trainer that you go on the road with for 275 hours of driving before being assigned a personal truck. The process usually takes about 6-8 weeks. Since we will be training in the same truck, we were transferred to the Omaha terminal. It’s called 2 plus 1 training, and it’s only for couples, or family members that are team drivers. We were given a rental car to drive to Omaha last Saturday. We dropped our personal vehicle at the house and had about a two hour visit in Montgomery. Then we headed for the Midwest. We drove non-stop to Kingdom City, Missouri and grabbed a little sleep at a Super 8 motel. On Sunday we completed the 1200 mile trip to Omaha. We checked into the HomeTown Lodge, also owned by Werner, on Sunday afternoon. Monday and Tuesday consisted of 8am safety meetings and shuttling back and forth from the hotel to the terminal. It’s about a five minute ride. The Werner shuttle makes round trips back and forth about every 20 minutes. They’ll also run you to Walmart, restaurants, or the movies. We have also attended classes on backing, how to install tire chains, and other driver stuff. We had a nice meal at the truck stop down the road on Sunday night, and Werner gave us a real nice first day lunch at their cafeteria, but most of the meals have been vending machine and microwave meals. Mrs. B has been doing her best to be the food police and keeping me from going junk food crazy. The best news is that we were assigned a trainer today. He’s on the way to Omaha to pick us up within the next couple of days. He’s currently delivering a load in Missouri, and should arrive in Omaha late Wednesday or early Thursday. We talked on the phone tonight; he sounds like a really nice guy, and we’re looking forward to meeting him. We will be on his truck for the next couple of months, so we hope that we like each other. We’re spending the day wrapping things up at the terminal, shipping our Christmas gifts to family, and packing for the road. We’ll continue to keep all of you updated as time allows. Til then, MERRY CHRISTMAS to all of you! We appreciate your prayers and support. The B Team is about ready to roll! Alright! Bananas, Bananas, Bananas. Thanks! We are so excited! Mrs. B an i both passed our CDL road test yesterday. We now have our Class A's with Doubles/Triples, Tanker and Hazmat. We have decided to team up with Werner. We feel good about what they have to offer for teams, and as a bonus, we will be able to train in the same truck. We will celebrate our 39th anniversary next Saturday. We know we love each other, now we get to see how much we like each other. We'll report for orientation on Monday, December 11th. We have a training diary on the training page if you care to follow the adventure. We are ready to roll! By the way, please pardon all of the verbose explanations about things that are commonly understood by those in the industry. These same posts are shared on FB for our friends and family. Hence the long explanations. We have been waiting to update our status until we had some news to share. We have some great news… Cheryl and I did our road test for our CDL this morning and WE PASSED! We now have Class A Commercial Drivers Licenses!! All the studying, shifting and backing practice has paid off. Thanks to the staff at Trenholm Community College; our instructors there are the best! Our tests went great. We both had to perform a pre-trip inspection for the first part of the exam. I had to do an “A” inspection. That is the front of the tractor; the exterior, engine, suspension, steering, and braking system, Cheryl got the “B” inspection which is the tractor from the engine compartment through the rear of the tractor, including the rear axle, suspension, tires, and braking system. We both had to do the coupling system; the fifth wheel and all of its components. Following that, we both had to do the three backing test required by the State of Alabama; a straight line back, and offset back, and a 90 degree alley dock. After that, we headed out with an examiner for the actual road test which is about a ten to twelve mile loop of divided highways, city streets, and interstate driving. Every turn, curve, intersection, and stop is graded. We both did very well, it really went by pretty fast. After a celebratory lunch at Mickey D’s, we went to the DMV and got our actual licenses. We have a few more nights of classes; we will cover subjects that we need to know that are not part of the testing, and we will graduate and receive our diplomas on Thursday (12/7). We have decided to go to work with Werner Industries. They are a large, national trucking company based in Omaha, Nebraska. We will be over the road (OTR) team drivers and will be traveling in 48 states. We will begin training at their Atlanta terminal on Monday, December 11th. We plan on doing some clothes shopping this coming week since us southern folks don’t have much real winter gear. We hope to be ready to report to work next week. Thanks again for your prayers and good wishes, keep them coming as we begin our training phase with Werner. We’ll post about our progress as time allows. More updates soon! Worked perfectly on my iPhone. Thanks Brett! Just curious, About how long did that plan take you to do? I'm starting to panic here. I live out west and take one hwy across a state not 10 different ones. Jim F - It probably took about 30-40 minutes to prepare the plan, and about another 45 minutes to actually create the log entries. If you are having trouble figuring out a route using an atlas, you could use Google Maps, or a GPS to get a basic idea of how to get from city to city. However, you MUST compare the route to a Motor Carriers Atlas to be sure that big trucks are allowed to use those roads. In the Rand McNally Atlas, the truck routes are highlighted in orange. In fact, in the example that I gave you, the route between Huntington, WV and Lynchburg, VA only has a couple of options to use, since trucks are not allowed on many of the roads in that area of the state. It's a mountainous area, and some of the roads aren't safe for trucks. After you do the pre-planning a few times it should become easier to do. If you have any more questions, just post them here, and I, or some of the other drivers on the forum, will be glad to try to help you. We now have four calendar weeks until we begin our new adventure. We only have fourteen class days left, and we are scheduled to take our driving test after only 8 more class days. We will not be going to class during the week of November 20-24; campus is closed for Thanksgiving. We’ll spend the final days of class after testing (December 1-7) practicing coupling & uncoupling, and talking about customer service issues. It’s coming together real fast now. We have been spending class days alternating between backing practice, driving the test loop, and studying our books getting as we get ready for our final exam. The final will be on November 27th. Our driving test will be on November 30th. We have both improved a lot in the backing department. We also are pretty confident that we’ll be okay on the pre-trip portion of the test. The part that is the most nerve wracking is the actual driving test portion. It will take place on several fairly busy roads, and you never know what the other drivers will do. Hopefully we’ll have a good day, and a successful test drive. We have now applied to six companies as team drivers, we’ve only ruled out two so far. The bonuses for team drivers are fantastic, and most of the benefits are similar at all of the firms. The length of training is also pretty much the same at most of them. The final decision is probably going to end up being a “gut feeling” kind of thing. We will probably update once more before we test out. That update will likely be at the end of next week. Keep us in your prayers. More info as soon as we have more to share. Jim F. - Hope the following helps you see what our trip planning training entails. Here is one of our trip planning exercises --- Using your Motor Carriers Atlas, you must determine your route, rest stops, daily shutdown times and locations, and make all scheduled appointments at the scheduled times. All required inspections should be logged, and all HOS rules must be followed. Home Terminal: Montgomery, Al – Tractor #98-01 Trailer # 94-01. Trip # JPT-03-1 NOTE: Each time you load or unload, show ¼ hour on-duty not driving and 2 hours in the sleeper berth. Starting date is first day of the month. Fuel every 1200 miles. When fueling, show ¼ hour on-duty not driving and ¾ hour off duty. Do not log more than 11hours without taking a 10 hour break. After driving 5 ½ hours, take 1 hour off duty, then continue driving. Flag town & state where you take your break. Lines 3 & 4 count against your70 hours. You cannot log more than 70 hours in any 8 consecutive days. You must do a pre-trip inspection when you leave your home terminal and once every day, before beginning driving. You must perform a post-trip inspection when you return to your home terminal. You must also show ¼ on-duty not driving each time you perform required inspections. **TRIP BEGINS** Day 01 – Leave Montgomery, AL at 10pm. Load goes to Huntington, WV. Manifest # 36674620. Day 03 – Unload in Huntington, WV at 1:30pm. Run empty to Lynchburg, VA. Day 04 – Load in Lynchburg, VA at 8am. Load goes to Cleveland, TN. Manifest # 5476980. Unload in Cleveland, TN at 9pm. Day 05 – Load in Cleveland, TN at 8am. Load goes to Montgomery, AL. Manifest #3462810. Unload in Montgomery, AL at 4pm. *END OF TRIP** We were required to do a written pre-trip plan showing our route, miles on each highway, hours to drive those miles, and all rest stops, and 10 hour breaks. Once that was complete, we then completely filled out a drivers log as if we had driven the trip. Hope that this helps you see how it worked. Only 12 more class days til Mrs. B and I take our final CDL test. We are both scheduled to test out on November 30th. We took our mid-term written exam last week, and we both scored in the high 90’s. It was a written exam of about 60 general knowledge questions, a vehicle systems and parts test, a pre-trip knowledge test, plus a simulated trip that had to be planned and logged. This past week we continued backing practice on the driving range, and practiced driving the test loop. We also took another road trip of about 100 miles. We began in afternoon drive city traffic, and continued driving through several area towns on rural two lane roads. We would drive 25 – 30 miles, and then swap with one of our fellow students. This is great “real life” practice since some of the turns are in small towns, even in little downtowns with small intersections. The classroom work has been more study on general knowledge, including customer relations, cargo securement, and international driving. It’s mostly practice, practice, practice as we get ready for the final driving test. We are still talking with 2 or 3 companies to see which one looks like the best fit for us. We should make a final decision within a week. We are finishing all of the final prep of turning the house over to our son and his fiancé. The will be renting our house when we take to the road. They have agreed to let us have a room for our home time stops. HaHa. Again, keep us in your prayers. We still have a little way to go. We’ll update everyone again at the end of this weeks training. Thanks Susan. New update coming by the end of the evening. We’re very excited about returning to the biz. Only about 18 more class days. We both will test out on November 30th. Sorry that I haven’t updated our progress for a couple of weeks. We have had a lot going on as we get closer to hitting the road. We had a yard sale two Saturdays in a row and eliminated a lot of junk that we didn’t need. I discovered that if you call it “stuff” instead of “junk” that you can get a better price for it. CDL training has been progressing well. Since the last update, we have spent a lot of time working on pre-trip inspections and backing. If you are not familiar with a pre-trip inspection, it requires you to identify almost every engine part, suspension part, brake part and all rims and tires. They must be inspected and you are required to verbally verify their condition to the inspector. This safety inspection is a critical part of the CDL testing. To do this for the entire vehicle and trailer can take over a half hour. You must also do this for the inside of the vehicle as well. That part is called the in-cab inspection. It includes a complete brake system check. No mistakes are allowed on any of this portion of the test. Following the pre-trip, you must perform three backing maneuvers, and if you pass all of that, you get to do the driving test. We have also begun practicing driving on the test loop, which is the route that we will take when we are tested for our CDL. Our in-class work has centered primarily on trip planning. You have to figure the time required, fuel use and rest periods for hypothetical trips. We have also had a couple more recruiters come by to encourage us to consider working for their companies. On Friday of this week we took our mid-term exams. Mrs. B & I think that we did okay on them. We’ll find out next week. We have about twenty more class days before we hit the road. We will continue to update our progress in class, and we’ll let you know what company we plan on driving for pretty soon. We’ve narrowed it down to three or four at this point. Keep us in your prayers, another update on the way soon! By the way, HOV should be HOS. Hours of service. Autocorrect can reall do some silly things. My wife and I studied the High Road Training for about 3 months prior to starting CDL school. I cannot begin to tell you how much it helped us. We aced all of the elements and endorsements when we tested at the DMV. In our classes, we have been able to tutor the other students on HOV rules as well. If you complete and pass the High Road Training, you will not have any problem with these areas in school. You can concentrate on your driving skills (shifting/backing/pretrip). The videos and checklists on pretrip are also invaluable. Thank you to Daniel B for that one! And thanks again to Brett and the moderators for all that they offer! One word of caution about cleaning glass with razor blades. Be sure to wet the window before scraping with a blade. Doesn’t have to be soap, water will do, but scraping dry glass is asking for trouble. I was a cleaning company owner in a previous life. Trust me on this one! Love the new menu. Great job! It is hard to believe that we are almost half way through with CDL training. Week 4 was an interesting week. We had a visit from a recruiter from Wiley Sanders Truck Lines. He is also a driver, and had a fun and interesting presentation full of stories from the road. We continued our trip planning and logging training. We were given an imaginary tip that started in Montgomery that had a specified time to unload in Huntington, WV. After unloading in Huntington, we deadheaded to pick up a second load at a specific time in Lynchburg, VA. That load was to go to Cleveland, TN. You guessed right, it had a timed appointment as well. After delivering in Cleveland, we picked up another load that brought us back to Montgomery. And yes, it also had a specific time to deliver. We were told that we had to perform pre-trip inspections as required, average 50 mph, take a 1 hour break after every 5 ½ hours of driving, and follow all DOT requirements regarding 14 and 11 hour rules. After figuring out the most efficient routes to make sure that you could make the appointments on time, we had to log the trip on driver logs as if we actually completed the trip. By the way, this was a 5 day run. On Wednesday and Thursday we took the trucks out on road trips. Our class of 10 was divided into two teams of five. Mrs. B and I were in different trucks. (Our instructors want to ensure that we’re still married at graduation time) On Wednesday we drove from the school to exit 79 on I-85. (About 75 miles) We parked at a shopping center, grabbed a fast food supper, and drove back to Montgomery. I drove from exit 64 to exit 79, parked for supper, then drove back to exit 64. Mrs. B drove from exit 64 to exit 26 on the way back. The total trip was about 150 miles. On Thursday we drove from Montgomery to Sylacauga, AL and back on 2-lane rural roads. I got to leave the training facility and drive through Montgomery traffic during rush hour. That will humble you real fast. Mrs. B's turn was from Clanton, AL to Rockford, AL on Alabama Highway 22. That’s like a rollercoaster ride. It’s an adventure in a car, it’s more like a thrill ride in an 18-wheeler. This route was about 225 miles long. It was a great experience and brought some reality to the adventure that we’re about to begin. Friday was spent on the backing range. Lots of practice on the alley dock maneuver. As most of you know, it’s the most challenging backing move, and the one that we’ll probably use the most once we’re on the road. It’s also one of the three required on the road test. Again, we cherish your prayers and good wishes as the big day looms closer and closer. Can’t wait to give you the next update! Week 3 of CDL training at Trenholm Community College is complete. It's amazing how fast time flies when you're having fun. This week we worked on trip planning, logging, and driving skills. We actually got to take the trucks out on paved streets for the first time; and we finally made right turns! The trip planning required us to create drivers logs from theoretical trip narratives. We had to make sure that we observed all of the 11 hour driving and 14 hour working rules as well as show all of our required pre-trip inspections and breaks. The trips required correct routing to make appointments for loading and unloading on time. We also had to do pre-trip inspections on our school trucks at the beginning of class each day and grade each other. This is one of the more intensive parts of training because you have to memorize this routine and recall it on cue. It's a challenge to learn every part of your tractor and trailer and their respective functions without missing any of them. Daniel B's Pre-trip checklist has helped us tremendously! Once again, Trucking Truth's CDL Training provides a way to help us reach our goal. Thanks to Brett (and Daniel B.)! We have also learned the required backing maneuvers; straight line, offset, and alley dock. We'll keep practicing them daily as we work closer to our final exam. Lots of jack, jack, jack, and chase, chase, chase. Gets easier everytime! Again, kudos to our instructors, Kent & Chuck. These guys really love this business and want every class member to master the skills and knowledge required to be successful truckers. Mrs, B & I promise to keep you up to date on our progress and we appreciate your good wishes and prayers. Seven weeks to go! Well, week 2 of CDL training is in the books. Lots of shifting practice on the range, straight line backing, and last night we started learning the 90 degree alley dock. We have a couple of fantastic trainers that are really dedicated to making sure that our class learns how to do things right. We are all getting more comfortable in the drivers seat. Our classroom time has been centered around trip planning. If you are going to be successful in this industry, as we've all read over & over on the TT forum, time management is probably the most important area to learn. Trucking runs on a tight schedule, and the gubment regulations make it tough to get things done efficiently. With Murphy's Law factored in, it can be a challenge. As I said earlier, our instructors do everything that they can to get us up to speed. We have had visits from a couple of recruiters from trucking companies. It's interesting to compare the different approaches as they try to get us to want to join their respective companies. Mrs. B and I are really excited about this lifestyle and career change! We really appreciate your prayers and support. Thanks! Stay tuned, we'll update again soon. Guys - Keep it up! The High Road Training will ensure that you will pass the CDL exams with ease. My wife and I completed the High Road about a week before visiting the DMV and we passed all of the elements with no trouble. We took and passed everything except school bus. By the way, don’t listen to the whiners complaining about the repetitive questions. They are there for a reason. You’ll remember the info much better that any other method of study. Good luck and study on!